JFree.org is home to a number of free software projects targetting the Java platform. This site is maintained by David Gilbert and sponsored by Object Refinery Limited. FXGraphics2D 1.7 is released, this is a bug-fix release. JFreeSVG 3.3 is released, this is a minor bug-fix release. JFreeChart 1.5.0 is released, alongside JFreeChart-FX 1.0 and FXGraphics2D 1.6. FXGraphics2D 1.5 is released, with improved text measurement options. JFreeSVG 3.2 is released, with improved width, height and viewBox attribute support and bug fixes based on user feedback. JFreeSVG 3.1 is released, with improved ellipse output, font metrics and a fix for gradient paints with transparency. FXGraphics2D 1.2 is released, now including dashed line support, improved performance, and updated demos. JFreeSVG 3.0 is released, with improved line style handling, ZIP output, fixes for path iterators and image drawing, plus updated demos. JFreeChart 1.0.19 is now available, with improved rendering hints and important fixes for the recently added JavaFX support. A free Java chart library. JFreeChart supports pie charts (2D and 3D), bar charts (horizontal and vertical, regular and stacked), line charts, scatter plots, time series charts, high-low-open-close charts, candlestick plots, Gantt charts, combined plots, thermometers, dials and more. JFreeChart can be used in client-side and server-side applications. This project is maintained by David Gilbert. JFreeSVG is a fast, lightweight, Scalable Vector Graphics (SVG) generator that extends Java2D's Graphics2D class to provide a standardised way to generate SVG from Java code. JFreeSVG is an excellent companion to JFreeChart. This project is maintained by David Gilbert. A library that provides a Graphics2D implementation that targets the JavaFX Canvas. 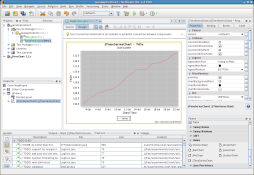 This has been created to provide JavaFX support in Orson Charts and JFreeChart. This site is funded by Object Refinery Limited. It may get better than this, but I don't mind if it doesn't.